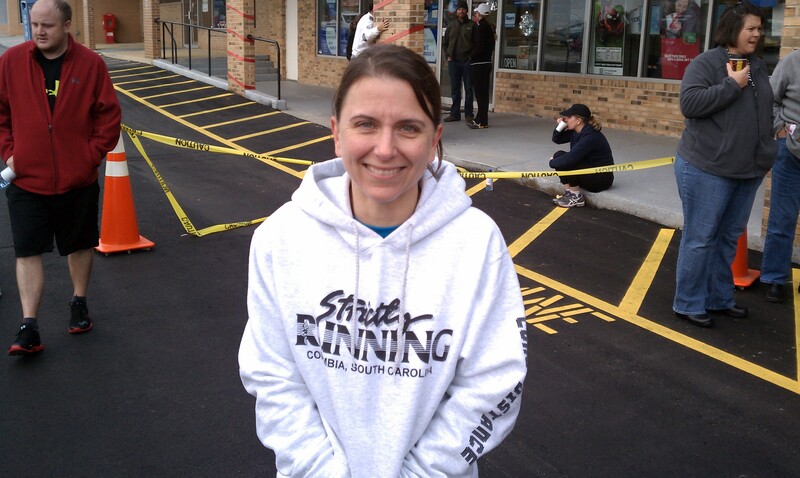 This is another 5k benefiting a police department, in this case the k9 unit for richland county PD. 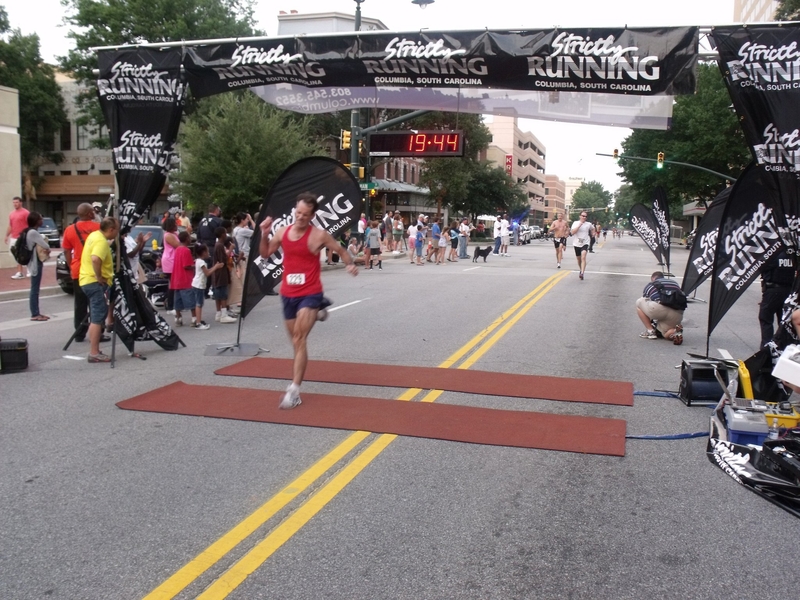 Its also another first time event, using the 5k course from the Palmetto Half Marathon/5k held in April. There was no reason for me to do this race, as its not on the Tour de Columbia and certainly not a unique distance or venue, but its 5 minutes from my house, so how could I pass that up? Race time was 730, thankfully a little earlier than most races, as the high today was supposed to be in the high 90’s. Temp was hovering around 80, humidity was sauna like as always. There was a fair size crowd for this event, totaling almost 150 people. As it was not tied into a race series, I didnt see a whole lot of regulars. However, Code Brown was there, as well as Angel, so I knew my best age group showing was probably going to be 3rd. The Howells and Eric McMichael showed up, and Ryan Plexico was there to assure that no one else had McGaha-like fantasies of winning this thing. It was good to see Chrissy Barrickman and her husband John, both of whom I havent seen in awhile. Course started at the Plex, wound through the Village at Sandhill mall, then went out on Clemson rd. The 2nd and 3rd miles were going to be tough, as you had to climb the bridge over two notch, descend down the offramp, then go right back up a steep onramp back onto clemson and finishing at the VAS fountain. With the gun, everybody did their best Kenyan imitation and of course I got caught up in it. First mile was almost completely flat, slowed only a few turns. Immediately evident was the police helicopter hovering overhead, which apparently was taking pictures of the event. Many of us were wondering if the cost of operating the helicopter might of wiped out any profit form the event, but I’ll leave that up to Sheriff Lott. The helicopter was actually kind of annoying, as I felt like one of those police chase criminals running from their car after they blew out the tires. First mile split was just short of masochistic, 6:03. Given the heat definitely being in play, I was afraid I might of overheated the engine. I purposely let off the gas a bit, and an older guy in a singlet passed me. By this point I could tell that the field had thinned out a lot, as it got pretty quiet (I guess helicopter guy decided to give it a rest). Singlet guy helped me pace the rest of the way, as I tried to keep up the 20 meter gap he had put on me. Second mile was pretty tough, with a long steady climb up the overpass bridge over two notch. Sun started beating down and famously hot columbia started making itself known. Downhill on the off ramp was definitely a relief and I hit mile 2 at 6:20. Felt good to still be banking seconds against 20 minutes (6:26 pace), but ahead of me was the on ramp. It was steep, and hot. Started sucking wind pretty bad and form went to crap, arm flapping and head bobbing commenced. Apparently it was taking its toll on the rest of the field even worse because I creeped up on singlet guy and another unknown guy. Code Brown was visible but too far ahead to take down. After cresting the bridge, it was all downhill and flat the last half mile. I started slowly releasing the blue shoes at this point and pulled up even with singlet at the last turn. Passed him there and could make out the finish clock turning over to the 19’s. Tried to catch the other guy but he had gapped me just a little too much. I never looked at my mile 3 split, but I imagine it was a little slower than mile 2. Was able to sprint to the finish at 19:38 officially. 7th place overall, 4th in age group. 35-39 is just ridiculous in this city.I had to bolt from the race to leave immediately for Folly Beach to beat the weekend crowd, so I missed the awards. This turned out to be good, because they only awarded 1st in each age group, which is pretty lame really. Of course I wouldnt have even made the usual three deep awards. Still pretty happy with the time, considering that tough middle section of the course and the heat/humidity. The third week of the SR track series felt more like fall after the last two 100+ heat index meets. Eighty degrees by the start, though it had just rained and the humidity was still killer. I had originally planned just to run the mile at the end, but I figured the 200 would be safe to do given the near 30 minute difference between the two events. There were 12 people for this event, and some seriously tough competition – OJ Striggles, Angel and Omar, Komatsu, Nedrick Rivers, Eric Allers, David He – all these guys run 18 minutes or better for the 5k, OJ does 15. Tigs was there to represent the women. Rick, Jeff and I felt seriously slow with this group. I had never run a 200 before, even in training. I do 400’s all the time for intervals but never an all out sprint like this. There were 9 entrants into the 200, so they did 2 heats. The fast dudes lined up first, so Rick, Jeff ,myself and Hou-Yin Chang ran the slow guys heat afterwards. Nedrick Rivers crushed the 200 in the first heat, going out strong and leading all the way, edging out Omar and OJ close behind. I lined up in the second heat and had a pretty good start, and basically just blasted pure blue shoes kick as hard as I could go. Down the straightaway i could feel my form breaking down but was able to keep going strong. With a race this short, it felt almost completely a test of leg strength, with very little aerobic endurance involved. I was able to hit my goal of sub 30 with a 28.89 sec. Won my heat but finished 4th overall, just 0.4 short of OJ’s third. Wondered afterward if I could have pushed it just a bit more if I was in the first heat, but I was OK with the time and effort. I wanted to do the 3000 but I knew there was no way to give a good effort in the mile if I did that one. OJ won after apparently recruiting another guy to rabbit for him – he had a nice kick to break 10 minutes. Omar and Angel finished a close 2-3 at 10:15 or so. I also skipped the 600 – Nedrick took this race easily, beating the field by 7 seconds. I would have liked to see another 400, since I had never seen the 600 ever run. The mile was my focus for this meet, since my last attempt at the distance was destroyed by the 400 race and the heat. I had never run an all out mile , but I figured I could do around 5:30 , based on my 5k splits (low 6). Tigs had said she was going to do 1:27 400 splits, so I planned to start with this pace and see how I felt. However, everybody went out fast and I ended up a shade over 1:20 on the first 400. I was getting out of breath quickly, so I faded a bit on the 2nd 400 to around a 2:50 800. Started feeling stronger midway through the 3rd lap with my lungs cooperating better. Hit the 1200 at about 4:20ish, so I knew I would have to blast the last lap to hit my projected time. I was able to crush a pretty strong first 200 but my lungs were burning by the time I hit the last straightaway. Thought I could catch David He in the last 50 but he threw down a vicious kick at just the right moment to match my effort. Finished in 5:35, 6th out of 11. I was pretty happy with the time for my first real attempt at the mile distance, especially with the heat still a factor. OJ took the race, crushing a 4:42. 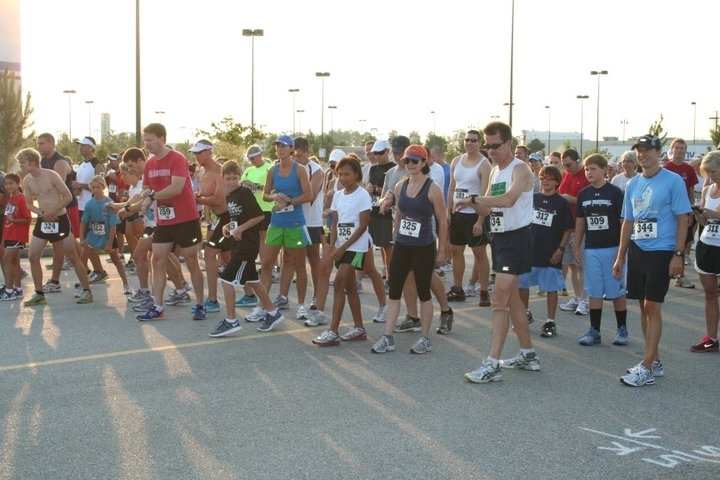 Next up: Guardians of the Night 5k on 7/30/11, Hot Summer Night 5k on 8/6. This is a first time event benefiting the Columbia Police Dept. I had signed up a few weeks ago, since I like nighttime races and the course they posted was near pancake flat. Started on Main St, wrapped around the State House, rejoined Main on the other side, looped back by the horseshoe, went into university hill past capstone and traced back to main at the Columbia Museum of Art. http://www.usatf.org/events/courses/maps/showMap.asp?courseID=SC11006DW. Big crowd at the start, everybody sweating profusely already. My main strategy was just to avoid the bonk in this race. The heat had me seriously scared. I knew if I did the usual sub 610 first mile there would be a death march in my future. I tried to hold back some when the gun sounded, though its hard not to get carried away. I paced with Greg Howell for the first mile, and we crossed the marker right at 620, near Hunter-Gatherer. I felt surprisingly good, perhaps because I didnt blast the pace and there was a little breeze that helped. I worked at just maintaining this pace most of the way home. 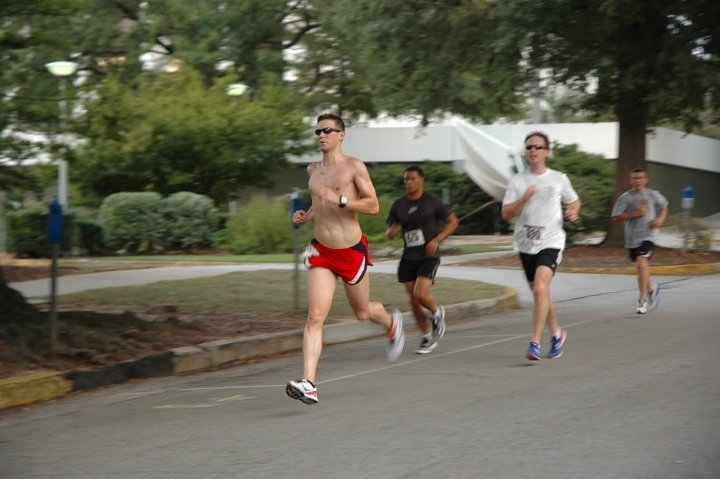 I was able to start moving up in the pack going the same speed, as the heat started to take its toll on a few. I still hemorrhaged a few seconds on mile 2 – there is a slight incline heading towards capstone and my breathing started getting rough. Was able to pass the 2nd female Megan Weis right at the marker, 1250 something. She’s usually a good marker for how my race is going, as we seem to be around the same 5k pace in the last year. With 1.1 to go I decided to give it all I could. I figured I was safe from any terrible blow up this close to the finish. Managed to pass the OG on Senate st, though i know he’s not been 100 percent. Under a half mile to go I passed a guy who looked suspiciously 35-39 so I tried to use this as motivation to push it hard. Kicked it in as hard as I could in the last turn, since I knew it was about a quarter mile to the finish. I was half delirious but was able to make out the clock changing to the 19’s. It felt like it took forever, but was able to hit the finish at 19:47, actually passing a few in the last 100 meters. Really happy with the time, since I was projecting probably 20:15 with the heat. 11th overall, 2nd in age group behind Code Brown. Good thing I finished strong because 3rd was 2 sec behind me. Gotta figure out who this Hellwig guy is. Some guy I’ve never heard of won the race in low 15’s, just incredible. Amy McDonaugh won overall female at 1930ish. Post race spread was nice with a cooldown sprayer, and ice cold water and gatorade, plenty of food. This is the second part of the three date Strictly Running series. My original plan was to do all three events, since the heat was not going to make a great time possible in any of the events, even if I saved up for one. My “warmup” consisted of 24 hamster wheel laps (2 miles) on the indoor track at Gold’s gym, which I figured was still better than the 100 degree temps outside. When I got to the track there were already a few people there, and the final group was about 10 or so. I’m not sure what happened, but there was no official SR rep there or a time clock by 630. Luckily a guy volunteered to start the events and keep track of laps. I had never done the 3000 before but decided I would try to race this event all out. I knew I’d be cashed anyway for the other events in the heat. I had figured out a 1:27 quarter pace would put me on pace for 11 minutes, which (under ideal conditions) is what I would hope to run. With the start I felt pretty good, trying not to go out too hard. Hit the first 400 in 1:31, second at just over 3 minutes. The mile was just over 6 minutes, but the heat was really kicking in by then and I started hurting big time. Basically sucked wind the whole last 3.5 laps. Made a point of not getting lapped by Omar and Matt who I knew would crush the field. Barely did that. I was able to muster a little sprint in the last straightaway, finished around 11:34, 3rd place. After the 3000 I was completely overheated and feeling near death, so I decided to skip the 800, which was less than 10 min later. The race was cool to watch – Angel went out fast with SR runner Randy Finn, both crossed just a shade over 60 sec. Eric McMichael then threw down a ridiculous kick in the last 150 to overtake both of them and finish around 2:10. 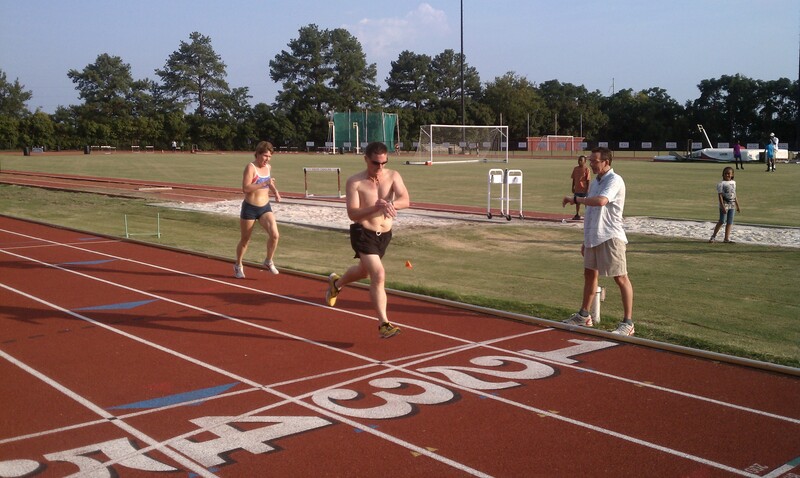 I was still half alive at the 1500 start but I decided to give it a go for the sake of a workout, if not for time. Went out trying to go slow but found myself getting passed a lot , which my fragile ego apparently cant handle. Tucked in behind Crazy Legs Schmitz for the first two laps, and was right at 4:30 with a quarter to go. Made a point of trying to break 6 minutes and was able to sprint to a 5:55. Not bad considering how wiped out I was from the 3000. Now I’m just hoping the weather gives us a break for the Capital City Safe 5k on Friday night in downtown Columbia. 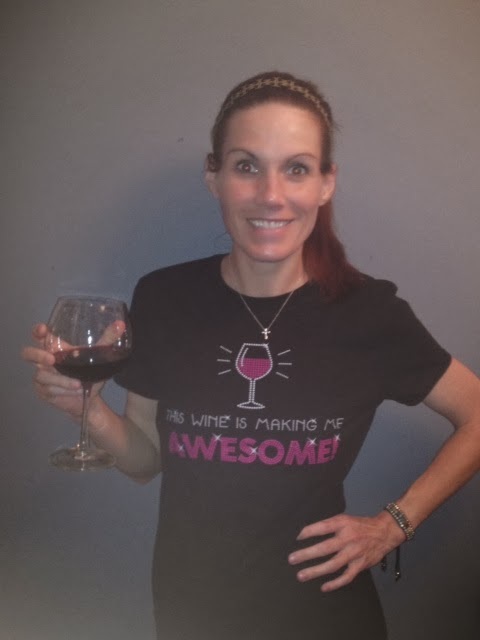 Had to sift through the runners world forums but was able to import all my old race reports. Will have to attach pictures later. I stopped writing them after my Richmond marathon debacle but I’ll be adding more soon. This is the renewal of Strictly Running’s track Summer track series, which I last ran in 2009, but didnt happen last year. They charge 5 bucks to run all three events (3200, 400 and 1600), and the series is held on the USC track, so a pretty good deal. Last time I ran this I raced the 2 mile all out (13:07 I think) and then had zero left for the next two events (1:12 in the 400 and a death march 6:58 in the mile). I had hoped to post strong times in both the 400 and the mile this time around, as my fitness was certainly a lot better and I had never done either of these events since. My goal was to hover around 60 seconds for the 400 and sub 5:30 in the mile. Unfortunately, Columbia’s summer was not cooperating. The high was 100 that day and humidity was close to 100 percent – weather channel had a 110 heat index even at the time of the meet at 6:30. I “warmed up” for mile and was already drenched in sweat, just felt awful. The 3200 was interesting as a high schooler Omar Sharif from Eau Claire/RU running club went at it with Matt Komatsu, a 30 something guy that I’ve seen run 17’s in 5ks this year. They ran together the entire way until Sharif threw down a crazy kick and edged Komatsu by several meters, 10:41 to 10:47. About 10 minutes later they started the 400. 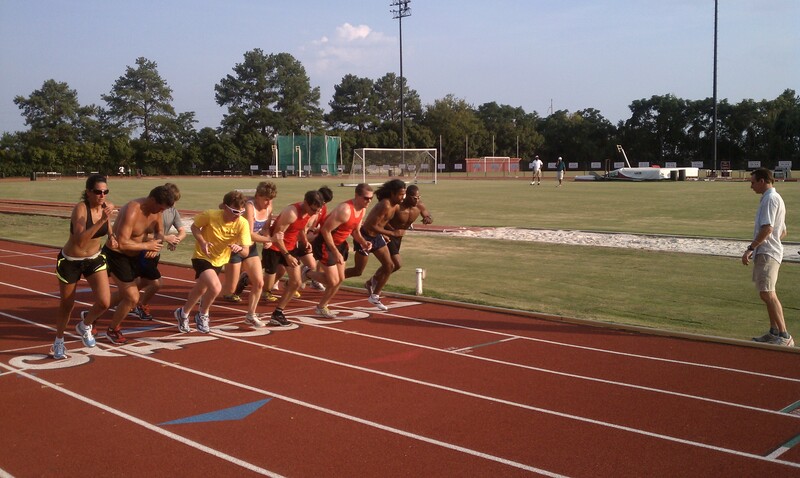 I had never run an all out quarter, though I do them all the time in intervals in speedwork. The intervals usually range 1:15 to 1:28 or so. I picked lane 1, which was probably not the best idea, since the curve is sharper and harder to generate speed off the turns. I had no idea how punishing this race is – I was really struggling at about 200 meters but was able to push hard in the last straightaway. Eric Mcmichael, who has been an age group rival in other races on the Tour de Columbia, completely blew this race away in 54 seconds. I was second, an embarrassing 9 seconds behind at 65 seconds (though I swear it was more like 63 or 64). I thought the 400 would be a good prep for the mile, which was about 10-15 minutes later, but it turned out the quarter would be my undoing. I still felt wobbly and a little queasy at the start, so I knew this wasnt going to be good. As soon as the race started I felt weak, and started getting passed. I rounded the first 400 at 1:30 (6 min pace) and by the 800 was at 3:20 . I was about one step from dropping out when I decided to try and gut it out the best I could. I managed to just avoid getting lapped by Komatsu and Randy Huff in lap 3, who apparently had a photo finish at 4:58. I finally found a little push in the last quarter but the damage was already done, finished in 6:17. This was a tough pill to swallow, because I really wanted to see how well I could do at an intermediate distance, which I feel would be my strength. This mile was slower than my 5k Pr pace (6:11) and far slower than my fastest 5k split at 5:55. I was happy I didnt take the easy way out and drop though. 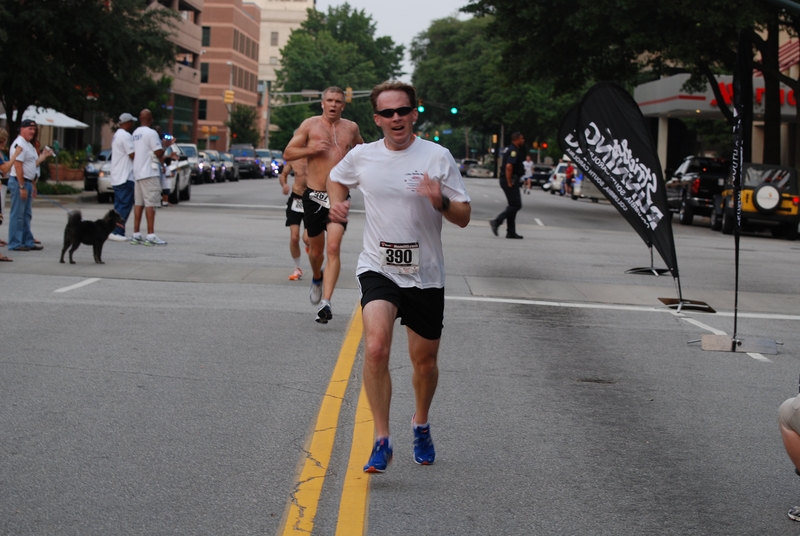 This was a race I decided to run purely for fun, as its not on the Tour de Columbia or Palmetto Grand Prix. There was a 5k and a half marathon available, and the race brought out a surprising amount of people for a very hot Sunday morning. Some of this was supplemented by runners who had traveled here from all over the US to continue to gather Xterra series points. I had run 10 miles the day before with my training group, and I was aware from experience how tough some of the Harbison trails were, so I opted for the 5k. Prices had jumped 10 bucks on race day (20/40) to (30/50), but I was already across town at 630, so I signed up anyway. Half started a little late but pretty close to 710 am, 5kers started a few minutes afterwards. Temps were in the high 70’s- low 80’s already and the humidity had to be close to 100 percent. At the start I knew this was going to be tough. The 10 miles from Saturday were making themselves known right from the start with about a quarter mile of open dirt road that was definitely uphill. There were a bunch of high school kids from Dutch Fork who blasted out of the gates, a few told me they had their sights on breaking 18 minutes. After the first quarter or so, it was mostly single track trail. Very winding, constantly going up and down. Really hard to build up any momentum. As with most technical trails, you’re always looking right in front of you and this makes everything seem longer (not to mention I was going about a minute and a half slower per mile than my 5k race pace). We had a good pack going for much of the first half which helped push me along. I was able to stay within the chain of runners from the front, so this helped navigating the twisty course I was mostly unfamiliar with. The heat was just suffocating. The trees seemed to block all the wind and the humidity felt like a warm wet blanket. I had left my Garmin at home, so I had no idea how fast I was going, but I was trying to push the effort as much as I could. With about a mile to go I recognized the home stretch from the half marathon (Ruldolph’s Rampage) that I did here back in December, so that motivated me to push ever harder. Unfortunately this involved navigating 2 separate long hills that about killed me. I did manage to pass a few people, including someone I thought was an age grouper (cant stop being competitive, apparently). The end brought you back into a field, which I sprinted as hard as I could to finish in 23:48 (7:40 pace). This was more than 3 minutes slower than my road 5k times, but was at least as hard as those efforts. Just completely dead at the finish. I found out later that they were awarding only the top 3 male and female finishers (I finished 10th), but I stuck around to see some of my friends finish the half. A major problem unfortunately occurred about 45 minutes in, as I saw 3 of the fastest runners in SC come bounding out of the woods completely off course. Somehow a number of people got lost on the 13.1 course, and even some doing the 5k. My race appeared well marked, but then again I was always following someone. There were a lot of upset people and several of the top half runners dropped out. I left early because the half was taking a very long time. I later checked the results and talked to a few who did the half, and all said it was just a brutal course, made especially tough with the heat/humidity. I hope the race comes back next year – im sure they can work out the course snafus. I’d actually like to see what that half course is all about too.